76ers fans and players alike can breathe a sigh of relief now that the team has gotten their first win under their belts. After a heart-breaking overtime loss to the Washington Wizards Tuesday night, the Sixers looked re-energized in Wednesday night’s contest, blowing out the Indiana Pacers 101-75 at the WFC. The 76ers formula for success was simple: get out in transition, control the boards and attack the basket. The 7-6 out-rebounded the Pacers 54-46, had more fast break points 24-10 and points in the paint 46-34. For a 76ers team that is usually mismatched in the frontcourt it was great to see them dominate the paint and boards in a win. Moving forward we have to continue to attack the basket the way we did, limiting ourselves to only 12 three point attempts while managing to get to the foul line 25 times (made 21). The tone was set early on in the contest when the 76ers jumped to an early lead. Starting center Spencer Hawes surprisingly got the ball club going with seven points early on, including a three pointer in the opening minutes. They continued to roll in the first quarter as Elton Brand hit a pair of two point jumpers followed by a Jrue Holiday layup from an Evan Turner pass. Holiday later on would show his athleticism with a lovely backcourt steal that transitioned into a dunk. The 76ers ended the quarter on a Lou Williams pull-up jumper to take the lead 31-16. The second quarter our beloved 76ers started with possibly our worst defensive lineup — Jason Kapono, Evan Turner, Lou Williams, Thaddeus Young and Marreese Speights. Right then and there I was convinced that we would blow the early lead. But happily, I was wrong. The defense held up and continued to force Indiana to take tough shots and not penetrate the lane. On the offensive side of the ball Thaddeus Young contributed nicely in the 2nd quarter with nine points, rounding out the half with 11 total points and five rebounds. Elton Brand had a solid half as well with 13 points and six boards. The half ended on a pretty eight foot jumper by rookie Evan Turner. Philadelphia built on their 1st quarter lead to extend it to 57-31. 57 points was the highest mark on the season through five games in only two quarters played. The Sixers were hitting on all cylinders and shot 53.7 percent from the field. The defense limited the Pacers to only 28.9 percent shooting and a season-low 31 points in a half. This is a Pacers team that has scored 31 points three times in a quarter this season, let alone 31 in a half. A pretty impressive feat for a team that has struggled defensively. 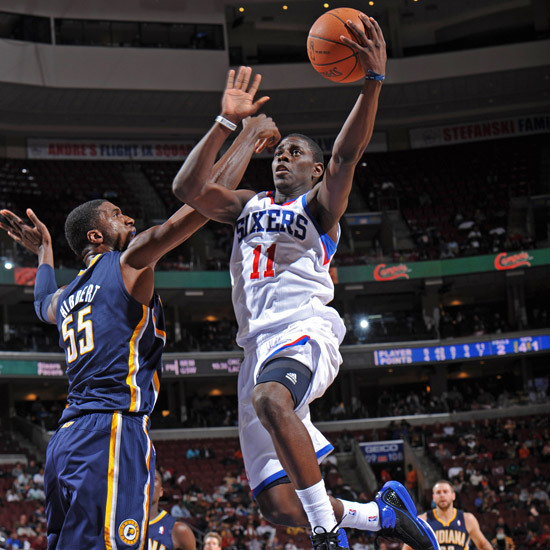 Despite a mid-3rd quarter 13-2 run by the Pacers the Sixers were still able to hold off the opposition in the 2ndhalf. Thanks to a complete all-around first half the Sixers were in cruise control for the rest of the ball game. Six players scored in double-figures and Marreese Speights had an impressive 11 rebounds. 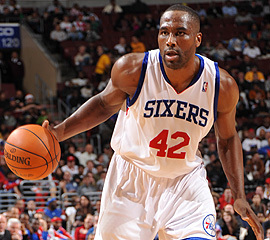 However, the game ball has to go to Elton Brand who has been playing very well thus far this season. Brand notched 25 points and 12 boards in 36 minutes against a challenging frontcourt featuring Roy Hibbert, Tyler Hansborough and Josh McRoberts. Brand’s mid range game has been very efficient and his 15-foot jump shot is on point. Through the first 5 games of the season Brand is averaging 18 & 9 per night. The last time EB put up those kind of numbers was in 2006-07 when he hit for 20 & 9 per game for the LAC (He played in 80 games that year) . Thaddeus Young contributed well with 16 points on 7-14 shooting. 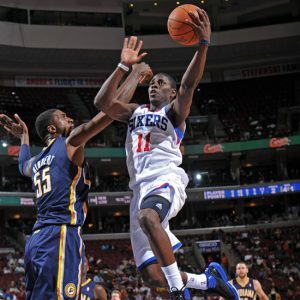 His running mates Jrue Holiday and Evan Turner combined for 23 points including four steals from Jrue. Holiday has been stellar defensively and his lateral quickness has given opposing guards fits — except for John Wall of course. Andres Nocioni curiously got his third consecutive start on the season. In the first two games of 2010-11 (verse the Heat and Hawks) Nocioni came off the bench and had 10 and 15 points respectively. In his last three games, all as part of the starting lineup, Nocioni has averaged a poor four points in an average of 20.3 minutes played. In Wednesday night’s start he didn’t score his first field goal until 9:30 in the third quarter when he connected on a three. Doug Collins is struggling to find a starter at the small forward position having all ready tried Nocioni and Kapono with little success. The skipper Doug Collins wasn’t around in the second half to celebrate his team’s first win. Collins couldn’t sit on the bench due to symptoms from a concussion he suffered on Memorial Day, his symptoms have been diagnosed as Vertigo. Doug will hopefully be healthy for the remainder of the season and this wont be an issue for him going ahead. Thankfully Philadunkia’s home team got their first win of the season last night. A good team effort and a completely dominant four quarter game in all aspects. Hopefully, we will see this team play more consistently at this level from here on out. NBA.com has the hightlights of last night’s Sixers win.